Last December I read all about this huge food blogger Cookie Swap where bloggers all over the country were sending cookies to one another. I regretted not participating and vowed that if there was a Cookie Swap Part II, I would definitely sign up. Lindsay and Julie decided to make this an annual thing, meaning I got a chance to take part! This year they teamed up with Cookies for Kid's Cancer. We all paid a small fee to sign up, and our donation went to Cookies for Kid's Cancer--which was also matched by OXO. The premise is this: you send one dozen cookies to three different bloggers and receive one dozen cookies from three different bloggers. Not a bad deal, right? I got my cookie recipients (Taylor from Greens and Chocolate, Tiffany from A Clove of Garlic, A Pinch of Salt, and Dorothy from Crazy for Crust) and got baking. Once again, Martha's Everyday Food Magazine came through for me! I ended up doubling the recipe because I needed cookies for something else and we had TONS of cookies on hand, which turned out to be a very good thing. 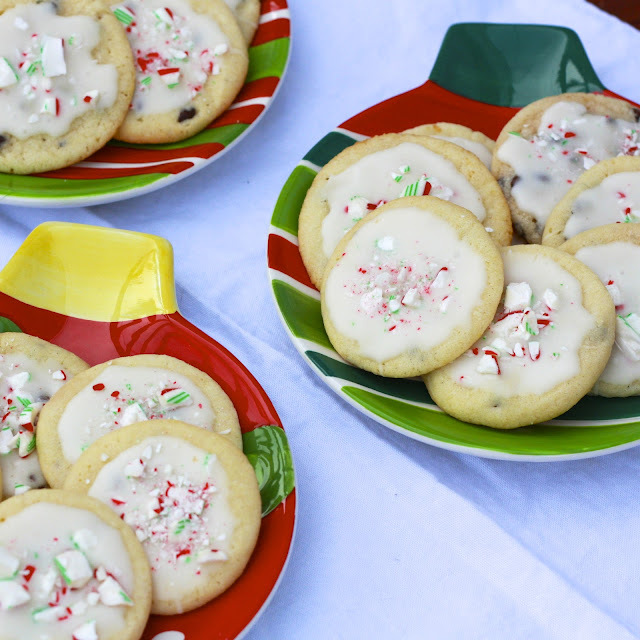 I was worried the cookies were a little too crisp when they first came out of the oven but after topping them with the glaze and peppermint candies they softened right up! You can definitely taste the mint, but not in a 'chewing gum' way. 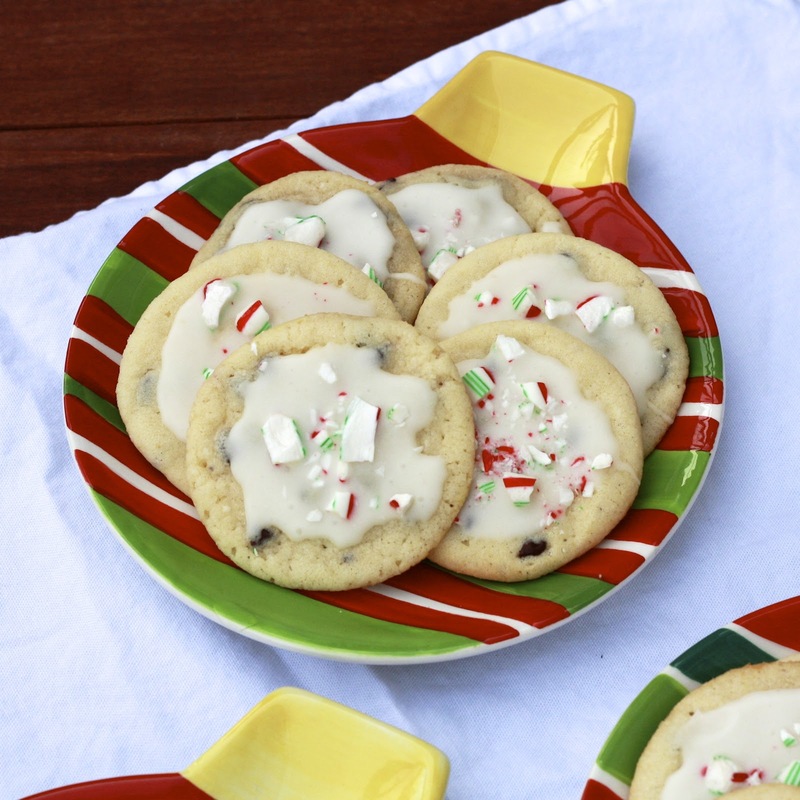 These are quintessential Christmas cookies! Special thanks to Dawn who sent me Swedish Thumbprint Cookies, Rebeka who sent chocolate coconut pinwheels and Sarah who sent Ooey Gooey Chocolate Cookies. We've already made a serious dent in both! 1. Preheat oven to 350F. Arrange racks on upper and lower thirds of oven. Combine flour, baking powder, and salt in a large bowl and set aside. 2. Beat butter with sugar and 1/4 tsp peppermint extract for 3 minutes, until pale and fluffy. Add egg, beating until combined. Stir in flour mixture followed by the chocolate chips. 3. Roll dough in 1 1/2 inch balls and place, 2 inches apart, on parchment lined baking sheets. Bake for 12 minutes, rotating sheets halfway through, until edges are lightly golden. Remove from oven and allow cookies to cool on the pan for 5 minutes before transferring cookies to wire racks to cool completely. 4. 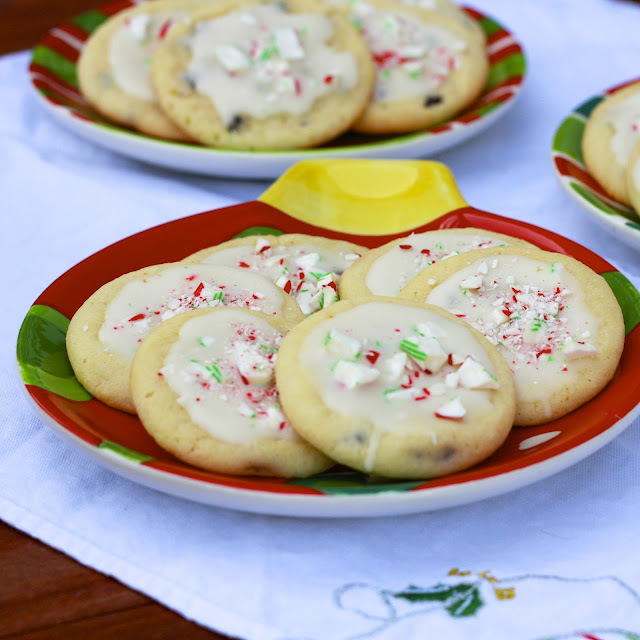 To make the glaze, stir together the confectioners' sugar and the heavy cream. Stir in 1/4 tsp peppermint extract. Mix until glaze is smooth and spreadable. Spread a thin layer of glaze on cookies and sprinkle with crushed candy canes. Allow to try completely before storing in an airtight container.